One of the most popular and beloved traditional Greek dishes, now done vegan! Juicy, creamy and absolutely delicious! Using only whole plant-based ingredients. For those who aren’t familiar with moussaka, some compare it to a Greek version of lasagna. The difference is that you use loads of fresh sliced vegetables to replace the noodles. 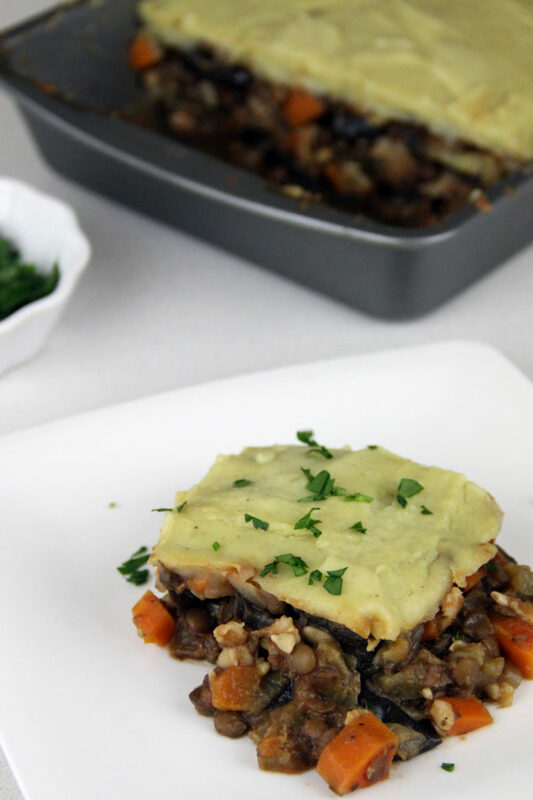 Moussaka is a really nice comfort food of Mediterranean cuisine, and if you love Mediterranean food then this is a must. The recipe is simple enough, although some might find it a bit time-consuming. But don’t let that hold you back from giving this dish a try. No special ingredients are required only things you probably already have in your house. I love these types of dishes, they’re the kind of dishes that you just want to share with your loved one and honestly, there is just something so therapeutic about spending a couple hours in the kitchen cooking and coming up with a meal that’s so comforting and seriously satisfying. This would also be an amazing dish to make on the weekend and take for lunch (or enjoy as leftovers) throughout the week. If you enjoy. For more Mediterranean dishes, be sure to check out our Greek Style Spaghetti Squash Pasta. If you try this recipe, let us know! Leave a comment, Pin for later, and don’t forget to tag a photo #avrecipes on Instagram. Wishing you a great time in the kitchen and abundant health friends! One of the most popular and beloved traditional Greek dishes, now done vegan! Juicy, creamy and absolutely delicious! Using only whole plant-based ingredients. Preheat oven to 400F. 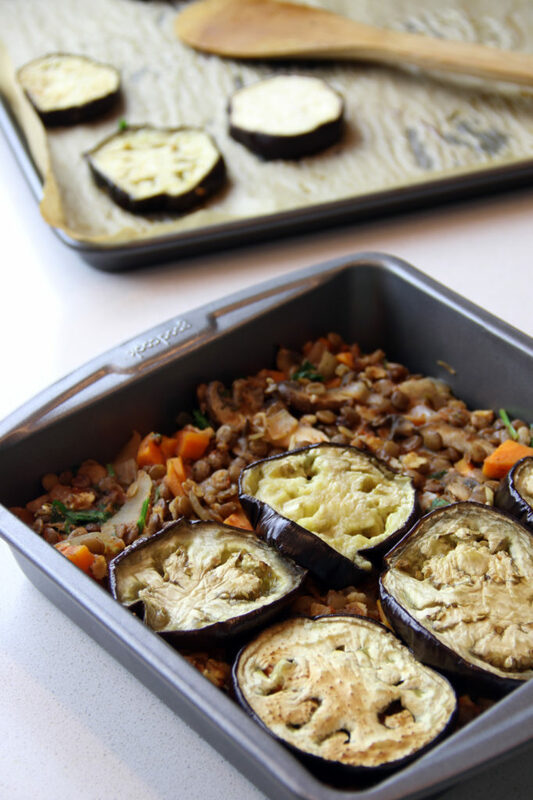 Line 2 large cookie sheets with unbleached parchment paper and arrange the eggplant slices on the baking sheets in a single layer. Roast in a 400 F oven for about 20 minutes, flip the slices and roast for another 10 minutes, until silky. Set aside. Lower the oven temperature to 375° F.
Drain and rinse the lentils. Cover them with clean water in a medium pot, and bring to a boil over high heat. Reduce the heat to a simmer and cook, covered, for 10-15 minutes or until tender, but not mushy. Drain over a strainer and set aside. Saute diced onion in oil on med-high heat for 3-4 minutes, add garlic, turn heat down to med-low and saute for 8-10 minutes until onions are tender. Add diced carrots, mushrooms, and sauté another 4-5 min. Add salt, pepper, Mediterranean herbs, cinnamon, lentils, sunflower seeds, oats and tomato puree, and chopped fresh parsley. Stir and cover and let simmer on med-low heat for 15 minutes. simmer on medium to low, for about 15 minutes. 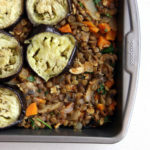 Arrange half of the eggplant slices on the bottom of a 9" x 9" baking dish. 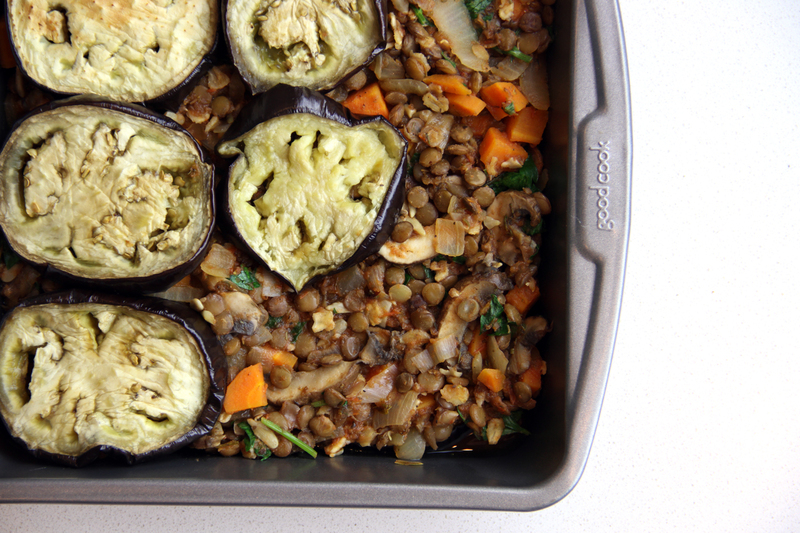 Top with half of the lentil mixture, followed by the remaining eggplant slices and lentils. 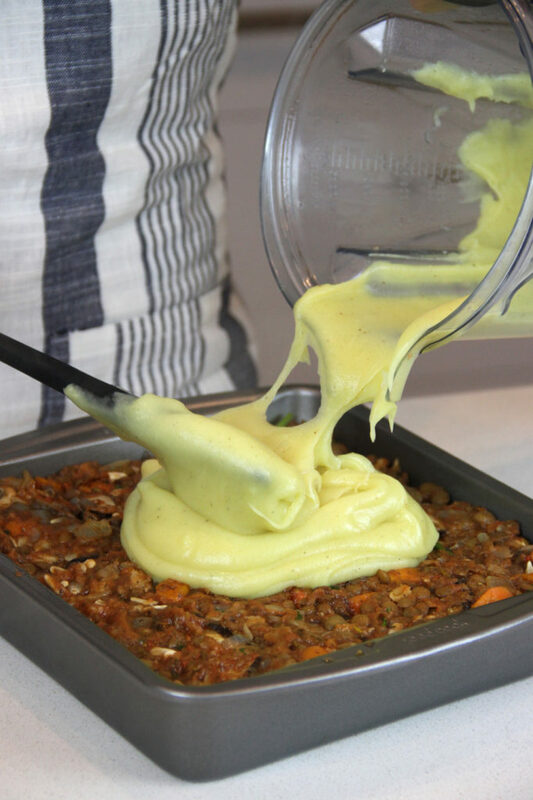 Using a spatula spread the mashed sweet potatoes on top, creating an evenly smooth layer. Bake for 35-40 minutes. Remove from the oven, let stand 10 minutes before slicing. Reserve this recipe for a day in which you have a liberal amount of time. It is perfect for Sunday dinner. You can make this one day ahead and refrigerate before baking. You can also freeze any leftovers. One important step in the recipe calls for salting or “degorging” the eggplant. Do not be tempted to skip this. It helps remove some of the bitterness, especially found in larger eggplants that have a lot of seeds ( where most of the bitterness is) by drawing out the bitter moisture. A very important step that some forget to do is roast the eggplant. This is a must! You can also grill it, if easier, but please, whatever you do, don’t put raw eggplant into the mousaka, it won’t have the texture or depth it needs! !